It’s Forgetful Freddie meets Rudolph the Reindeer! A heart-warming, visual prop for your holiday family show. The absent-minded Rudolph loses his red nose. What’s a reindeer to do? Substitute a balloon? 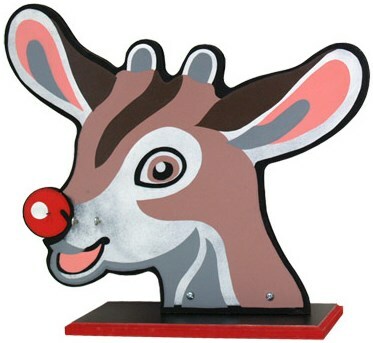 The other reindeer now have a good reason to call him names: “Balloon Nose,” “Air Horn” Oh, no! But luckily, Santa has magic powers. After getting Rudolph to promise that he’ll be a better 'rememberer,' the balloon magically pops and his red nose reappears! Check out the video to see the prop in action. The special gimmick to make the nose reappear. Children love stories about Rudolph the Red-nosed Reindeer. When you perform the “Forgetful” version, you’ll be able to make it magical – and perfect for the holidays!